This blog post has been turned into an eBook! With updated content, more ideas, longer descriptions, and a bonus introduction and conclusion section, the eBook will help you take your computer business marketing to the next level. Check it out now on Amazon: 80+ Ways to Advertise Your Computer Business. Customer Referrals – Probably the best free advertising around for your business. Few things are more powerful that a recommendation from someone you trust. Cold Calling – Not my favorite technique, but if you can get over the uncomfortable feeling, you may just find some local businesses in need of technical assistance that didn’t know where to turn. I recommend doing this with other businesses only, as calling private homes unsolicited is normally seen as intrusive and can have the opposite effect as intended. Door-to-door – Similar to cold calling, but may be more your speed if you prefer being face-to-face with prospective customers. Happy Hour – I’ve made a handful of business deals over a cold one. When you get together with a group of friends after work on a weekday you’ll normally be introduced to new people all in a friendly festive environment. Have some business cards handy, talk a bit about your business, and have fun! Attend Business Mixers – Similar to a happy hour, but designed for the purpose of meeting other business owners, these are usually coordinated by your local chamber of commerce or other business organization. Contribute Articles to Local Paper – Contact your local paper to see if they’d be interested in featuring a weekly tech column penned by you. Normally they’ll allow you to include a small blurb at the end of the article with info about your business. Teach a Class – Many organizations such as churches, senior homes, and community clubs hold workshops and classes on various topics for their members. Reach out to these places to see if you can teach a class on a basic computer skill or software. At the end of the class you can pass out business cards or write your business phone number and email on the board for folks to contact you with further questions. Volunteer – Similar to teaching a class, you can volunteer your time for other things such as free tech support for under-privileged households or help setting up an organization’s computer system. This will not only get your name out as a friendly resource for computer help, but it will allow you to meet community organizers who can become major allies for referrals in the future. Partnerships – Partner up with another local business to offer discounts to their customers or some other kind of cross promotion. You can partner with other businesses that do tech work that you don’t, like data recovery or web hosting, or you can partner with other service businesses like accountants and lawyers who can then recommend your business to their clients while you do the same for them. Press Release – Any time something changes in your business, whether it be a new service offering, a new location opening up, or a new partnership, be sure to send out a press release to your local papers and magazines. Sometimes they’ll go unpublished, but every now and then you’ll get something put in that will potentially get your business out in front of the eyeballs of thousands for free. Community Bulletin – If you live in an organized subdivision or community that has a Home Owners Association or some other organized group that servers local residents, send them a note about your business by offering to give them a discount. This form of hyper local marketing has worked really well for me in the past. Write a Book – I know this is easier said than done, but writing a book is a great way to establish yourself as an expert in your field. You don’t need necessarily need to get published by a major publisher either. A self-published book can still be sold on Amazon or online via your website with publishing provided by an on-demand publisher. Just put a unique spin on a computer repair topic or cover a tech topic in-depth. Who knows, you may release the next New York Times bestseller! Have a Catchy/Unique Business Name – A unique and catchy business name can go a long way in brand recognition and can be a way to create buzz about your business. Getting people to talk about your business is a great form of free advertising. Clever puns or cute techie names seem to go over really well. Be careful here though, as this can backfire if the name is too outrageous. SMS(text) Campaign – Texting is as popular now as ever, thanks to the rise in mobile phone use among members of all age groups and demographics. You can leverage this trend by first engaging your existing customer base. Include a check box on your invoices asking if your customers would accept exclusive offers via text message, and then ask them to leave their cell number. Then, a few times throughout the year, you can send an offer or special via text only. This post has some great info to get you started. Hold a Contest – Engage your existing customers and attract new ones by running regular contests. It can be as simple as asking folks to sign up for your mailing list or ‘Like’ your Facebook page. Then you can randomly draw one of those people to receive a small prize. Even better, make the prize branded with your logo or business name! Fliers – The old stand-by, fliers have been around for ages and are effective for both lemonade stands and full-fledged computer businesses. This is a numbers game, so get out as many as you can in as many places as you can. The cost is minimal if you can design your own. Tear-offs – The flier’s big sister, this is simply a flier with little tabs at the bottom with your contact info. People can “tear off” these tabs and take them so they don’t forget your info. Business Cards – This is probably the first advertising tool you should purchase for your business. Easy, portable, informative, and functional, the business card is essential. Check out my post on how to create an effective business card for your computer business. Magnets – Made popular by pizza places, refrigerator magnets are a great way to get your business in front of people’s faces daily. Give them out any way you can: in the mail, on the street. Give a handful to your customers to pass out for you. Pens – People use pens all the time. Why not remind them that your business exists in the process? It’s easy to get a bunch with your logo on it. Stickers – A fun and inexpensive way to leave a little promotional item with your customer, or their kids, that feels like it’s a prize or reward. Then, depending on where they put the sticker, it can serve as a mini advertisement. Mouse pads – Remind your clients that help is only a mouse click away. Mouse pads sit right next to a user’s computer, the perfect place for such a reminder. Shirts – A little bit more expensive than pens, magnets, stickers, and mouse pads, branded shirts are a great promotional item to give away and wear yourself. Door Hangers – Like fliers, door hangers are a great way to get your message out to the masses without being too intrusive. Walk around your neighborhood, get some sun and exercise, and hang these on your community’s door knobs. I’ve had some success with this method, and the cost of making the hangers is negligible. Phone Book – One of the most traditional forms of old-school advertising, the phone book used to be the premium place to get your business listed. People would look to the phone book for service listings in their area. While this is still certainly the case today, it’s getting less and less popular as online searches get more and more popular. Still, you should not overlook this form of advertising if you can afford it, it is still an effective way to get noticed. Direct Mail – Direct mail is an old form of advertising that is a great way to get your advertising directly to a large number of local prospects. It’s really a numbers game because most folks largely ignore the advertisements they get in the mail. However, there are a few people who read them and of those people there may be a few that need your services. So the more mailings you send out the better. However, it can start getting expensive, so use this method only if you have some spare money to spend on advertising. Make sure you include an enticing offer or discount on these mailings to get people’s attention. Road Signs – I’ve written about road signs in the past. I have yet to try them out, but I really want to, I think they’d be an easy way to get your business out in front of a bunch of eyeballs everyday. Sandwich Boards – An old-fashioned technique that still gets used today. This works best for those of you with a store-front business. Though I guess you could market your home business this way also, just send your sandwich board-wearer to a public park or someplace with high traffic. Human Sign Holders – Unless you’ve been living under a rock, or out in the country, you’ve probably seen these guys on a street corner at one time or another. These days, sign flippers help point drivers toward your store front in a flashy, attention-grabbing way. The best sign-holders have even been trained in the art of flipping, dancing, and putting on a show! It’s hard to ignore these guys….though I’m not quite sure how anyone has time to read the sign when it’s being tossed around so much! Billboards – This is a fairly expensive advertising method with rental costs ranging from a few hundred to a few thousand dollars a month for one sign in well trafficked areas. However, it can be worth it as most billboards will be seen by hundreds if not thousands of people every day. Bench/Bus Stop Advertising – An often overlooked advertising space, these are often less expensive than billboards, but still help get your brand in front of countless eyes. Sponsorships – Many local sports teams and other organizations seek small business sponsors to help fund their team and in return, they’ll promote your business. Reach out to them and see if they’d be interested in sponsorship. They usually require very little monetary help, but the reward you get from helping them is not only advertising, but also respect and recognition in your community. Vehicle Advertising – This is a popular method for many computer repair shops, from big chains like Geek Squad, franchises, and local businesses owners. If you do a lot of on-site computer work, it only makes sense to slap a car door magnet on your vehicle to get some advertising out of those miles you drive every day. You can even get your whole car painted if you’re feeling adventurous. TV Commercials – Producing your own TV commercial can no doubt be an effective way to advertise your business. However the costs associated with this can be quite high. Not only do you need to spend money to record, edit, and produce a decent looking commercial, but you also need to buy the air time on the TV station. The more potential viewers you have, the higher the price. However the rewards can be great, especially if you put together a memorable commercial. Radio Commercials – Along the same lines as a TV commercial, but cheaper. Radio ads may be more effective, for the money spent, than television because the majority of the time your audience is captive. Ads in Local Paper – This is a tougher sell in my book, as not only is readership in papers going down, but I’m not sure people notice the ads there too often. However you may be able to get a good deal with local papers. Join Your Local Chamber of Commerce – Most every county or area has a local Chamber of Commerce, which is a group of business owners that helps further the interest of business owners. They usually hold networking events, meetings, and various functions that are exclusive to members which are great opportunities to network with fellow business owners and seek B2B opportunities. Coupon Mailers – Many areas get books or envelopes of coupons for local businesses in the mail. Valpak is a big player in this market. I’m not sure of the effectiveness of using this for computer services, it seems more geared toward food and doctors/dentists, but I’d be curious to see how effective it could be for our industry. Sell Products – This is best done from a storefront, but you can also sell products from your website if you’re a remote-only tech. By selling products such as computer, accessories, etc, you become more than just a place to go for consulting services, you’re also the place to go to buy technology stuff. It’s hard to compete with the big dogs on price, so instead include free consulting hours or free set-up with your product sales. Trade Shows – Many communities hold computer trade shows allowing vendors to congregate all in one place to sell their tech. See if you can rent a booth at one of these to offer free virus removal or free software install to get your name and business out there. Website – Your first line of advertisement on the web is your website. You want to make sure you sell your services clearly enough to convert first time visitors into customers and show existing customers what else you can do for them. Craigslist – I’ve had some success with Craigslist, but it takes some work to filter out the noise of people looking for free work. Other Free Online Classifieds – There are other free online classifieds out there other than Craigslist, though they don’t get nearly as much traffic. But it doesn’t hurt to throw up an ad and see if you get any bites. Guest Posting – …which leads me to guest posting as an advertising technique on its own. If you like to write, there are countless numbers of blogs and websites that feature regular technology-related articles. For example: Derrick Wlodarz and Chuck Romano are regular contributors to Technibble.com. My buddy Tim Lenahan writes for multiple publications including AndroidTipGuys. The website owner usually lets you link back to your website at the end of your article. This is good for SEO, and also a good way to establish yourself as an expert. Link Exchange – Reach out to other local businesses that offer different and complimentary services to your own. Ask them if they’d be interested in exchanging links. You can list their business on a “recommended links” page on your website if they do the same on theirs. This has minimal SEO benefits, but their existing customers may then find out about your business this way and check out your website. Free Web Directories – There are many ways to list your business in directories online besides Yelp. Some examples include: ShowMeLocal, Spot-a-Business, FreeAdLists, Get Free Listing. The more of these directories you’re listed in, the better chance you’ll have of getting found online. Local Directories – Along with the above mentioned free directories, you can search Google for “yourtown or yourcounty or yourstate business directory” to find local business directories to list your business in. There are usually at least a few of these that you can find that will be willing to list your business. Google Places – Of the major search engines, Google is by far the most used, and therefore it’s the one you want to get your business listed on. For many local based searches, Google will present Google Places results, which can often appear at the top of the search results. This will also place a “marker” for your business on Google maps. You can go here to set up your profile. Google+ – Google’s social network has had mixed reviews among the general population, but as of this writing, Google is planning on merging Google+ and Google Places, so you probably want to claim your Google+ Business page so you’ll be set for the change. You can go here to get more info on this. Yelp – Along with the Yellow Pages online, Yelp profiles frequently show up at the top of Google search results. For that reason alone your business should be on Yelp. Along with that, Yelp has a large active community of visitors and reviewers who can help shine a light on your business. LinkedIn – Best for solo consultants who do mostly B2B (business to business) work, LinkedIn is a great place to show off your qualifications and network with people who may need your services. You can join one of many LinkedIn groups for your local area and establish yourself as the local tech expert. Twitter – It’s been around for a while and it’s still useful. I’ve written about Twitter as a way to get your daily dose of tech news, but it is also still a great tool to communicate directly with your customers. Try collecting the Twitter handles of your customers on your invoices or when they first contact you for service. Then you can inform them of specials, new services, and provide value with regular computing tips and tricks. There’s always the potential that they will retweet what you say to their friends which are all potential new customers. Facebook – This is still the social media site where most folks hang out. If you don’t have a Facebook page for your computer business yet, you need to get one! Pintrest – This is the hottest new craze in social networking now. Though I’m not quite sure how best to utilize it for computer consulting, you should still get a profile on there. You can share images of your shop, images that represent the different services you provide, and then link them all back to your business. Here’s a great article on getting started with Pintrest for your business. QR Codes – QR codes are a hot new marketing strategy these days. These are the bar-code looking symbols that you may see on posters and packages (see below). When a person scans these with their smart phone, the phone will take them to the website that’s embedded in the code. Find out how best to use them for your business here. YouTube – YouTube is a surprisingly effective marketing tool that I’ve used for some of my SEO customers. Simply create a quick video about your business, upload it to Youtube, and make sure to include a detailed description and link back to your site under the video. Youtube videos often show up in Google search results and many people search for things directly within Youtube. Check out Animoto.com to quickly and easily put together a slick presentation about your business, like this one I did for one of my SEO customers, a computer business in Claremont, CA. The video is now showing up on the first page for “Claremont Computer Repair”. Mobile-ready Website – People are increasingly searching the internet on their phones. If your website is flash-heavy, or has a lot of parts to it, it may be tough to see on a smart phone and therefore potential customers may move on. Have someone develop a mobile version of your website so people can easily see it and interact with it on their phone. ePress Release – You know that press release I mentioned earlier? You can also send an electronic copy of it to virtual press release distributors. These services will send it all over the net to spread the word about your business. Some of these services include: PR-Inside, Online PR, Big News, and PR USA just to name a few. Email Newsletter – A monthly or quarterly email newsletter is a great way to advertise to your existing customers. Of course you must provide valuable information first and foremost, but be sure to mention your services as well. 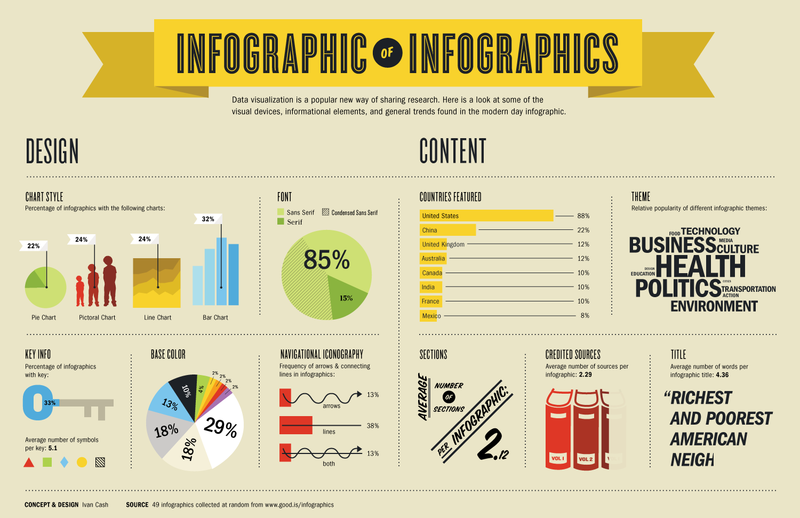 Infographic – A popular viral trend these days are infographics. These are illustrations or diagrams that creatively convey a certain message. I did one for the blog here recently, but there are much better ones out there, like this infographic about infographics. Article Marketing – If you like to write, a great way to get your business name and link out there is to write helpful articles for different article websites. Most of these websites allow you to include a brief author description at the end of your article in which you can include the contact info for your business. Some popular article directories include: Ezine Articles, InfoBarrel, Amazines, ArticleAlley, Go Articles, and Idea Marketers. A great strategy to take here is to write articles about your town or service area, this will ensure that your articles show up in search engines results for people in your area. Blogging – Blogging is another double-edged sword in your publicity arsenal. Not only does it provide fresh content for your customers and establishes you as an authority to prospective visitors, but it also helps with SEO, as Google continually states that they favor fresh, updated content when they rank websites in search results. HARO – Another great place to go for those of you who like to write is HARO (Help A Reporter Out). This is basically a website where you sign up as an expert in something (computer, tech, etc.) and you get the chance to be a source for a reporter looking for an experts take on whatever they’re writing about. If you get featured as a source, often your name and business name will be featured as well. There are some journalists that write for some big name publications that frequently use this service, so this is a great chance for you to get your name published in a legitimate nationally known news outlet. Hold a Webinar – A great way to engage the small business community in your area is to offer to host a webinar. A webinar is basically like a seminar, but it’s done completely online. You’ll need to find a way to contact business owners (LinkedIn and Facebook are good avenues) and get them to sign up, but you only need a handful of participants to make a big impact. Then, simply give an hour or so training class on some sort of technology pain point that SMB’s face, and at the end include a little plug for your services. Lewis Howes is a great resource for information on how to set up and market your webinars. Write an eBook – I’ve taken this approach with this blog, offering a free eBook in exchange for your email address. You can also take this approach with your computer business. Offer a free eBook in exchange for contact info so you can add them to your newsletter mailing list. Also, it’s easy to port your eBook to Amazon’s Kindle market for maximum distribution. Start a Podcast – I’ve highlighted some great tech podcasts here in the past. Not only is a podcast a great way to offer advice to other aspiring technicians, but it’s also a great way to get consulting work. I know for a fact that Mike Smith of the Mike Tech Show has gotten work as a direct result from his Podcast. You may have noticed the theme of “establishing yourself as an expert in your field” as a great way to increase your authority and get more clients. Join ACRBO – There are no licensing regulations around computer repair businesses in the US, or any other country as far as I know. That’s where ACRBO (Association of Computer Repair Business Owners) comes in. It serves as an organized way to bring legitimate computer businesses together under a common ethos and code of conduct. The association also provides its members with a listing in its directory (SEO!) as well as discounts on tools and training. By including the ACRBO branding on your website and advertisements, you show your potential customers that you’re serious about your business and that you’re part of a group of other professionals. This is specific to computer repair professionals only, but many other fields probably have similar associations. Web Directories – We covered some free directories earlier, but there are also many directories that require some form of payment to be listed. These directories are normally of higher quality, and offer better visibility to your links. They are also generally trusted more by search engines. Some good computer-repair specific ones to look into are: Computer Repair Expert, Top Computer Shops, PC Repair Directory, as well as some general directories like: Information Outpost, Abilogic, Big All, and Business Seek. Advanced SEO – If you happen to be in a very competitive market, say a big city like New York or San Fransisco, then it’s going to be pretty hard to get your business noticed in the search engines. That’s when you may want to seek the help of a professional SEO firm. These guys are experts at getting websites ranked well in tough markets, but the price can be pretty steep. Make sure to shop around and ask other business owners you trust for recommendations. Facebook Ads – Facebook is still the most popular kid in social media school. They also allow any business to create and run ads on their network. The best thing about these ads is that you can use Facebook’s vast amount of user data to laser-target your ads to a specific group of people. I wrote a whole post about how you can use Facebook ads for your computer business, so you can check that out for more info. LinkedIn Ads – LinkedIn recently opened up its own ad network, which I assume works similarly to Facebook’s, but is best for targeting business customers. I haven’t tried it myself, but there are some great tutorials available to get you started. Other Ad Networks – Besides the above listed online advertising networks, there are countless others out there. Some of the most well-known are: Yahoo! Advertising Network, Microsoft Ad Network, AdBrite, TribalFusion, and many more. Town Crier – This old school method of standing on a street corner and yelling at the top of your lungs is still a novel method if your storefront is located in a high foot-traffic area. Yell at cars or in an office building and be prepared for a hoarse throat or a lawsuit! Create a Mascot – Like the Michelin Man or the Geiko Gecko, a great mascot can serve as a fun and friendly ambassador for your business. They can show up at community events and commercials, giving your brand a fun and recognizable face. Desktop Wallpaper – If you can get away with it, especially on computers that are used by the public, install a custom wallpaper image with your business logo and contact info on it. Sell the idea to your customer by telling them it’s a way convenient way to remind them to call you when they have computer problems! Suitable for storefront locations only. The next three ideas come to us courtesy of an Entrepreneur.com article called 10 Unusual Ways to Advertise. These are my favorite three. Hand Stamps – Sponsor an event that requires attendees to get a hand stamp and then volunteer to supply them with a free customized stamp with your logo on it. Nighttime Silhouette – This was definitely a new one for me. The idea is to basically find a large wall on a busy road in town and project an image of your logo onto it at night. It’s like make-shift billboard that will surely get attention. Publicity Stunt – Do something noteworthy, crazy, but not destructive or mean-spirited, and you just might be able to pull this off. I think a viral video would fit in this category as well. However, it’s really hard to predict what kind of “stunt” will produce publicity, so tread carefully here. Well, there you have it, a HUGE list of advertising methods for you to try out. As always, a list is only as good as the action taken from it, so get out there and make a name for your business! Did I miss any advertising methods?! Have your tried any of these? How did it work out for you? Let me know in the comments below! 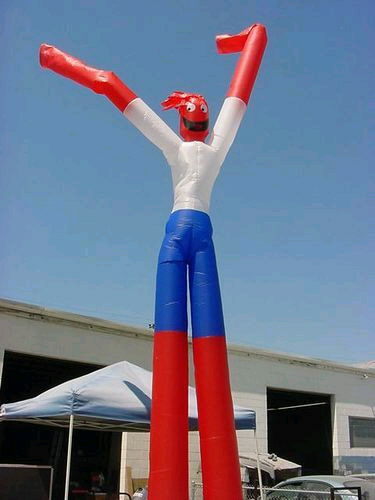 The Dancing Inflatible Man. You can never go wrong with anything that’s inflatible! Yeah, it’s easy to think of 80, but 81 is tough! Haha, thanks for the feedback! Great article Matthew! So many awesome ideas for advertising. I can’t wait to try out some of these methods. Thanks for spending the time to research and post. Thank Randy, glad you like it. Come back and let us know if you try any of these and how they work out for you. That’s quite a list you have. I have great success with Craigslist. You have to remember to use a great title AND include an eye catching graphic to stand out from the crowd. Don’t know if they work as well as the dancing inflatable guy but there are a whole host of local directories, like the mantas and the localtoms. One interesting new one seems to be YLocale that has listings with images and colors and combines reviews from Yelp, Foursquare and others.